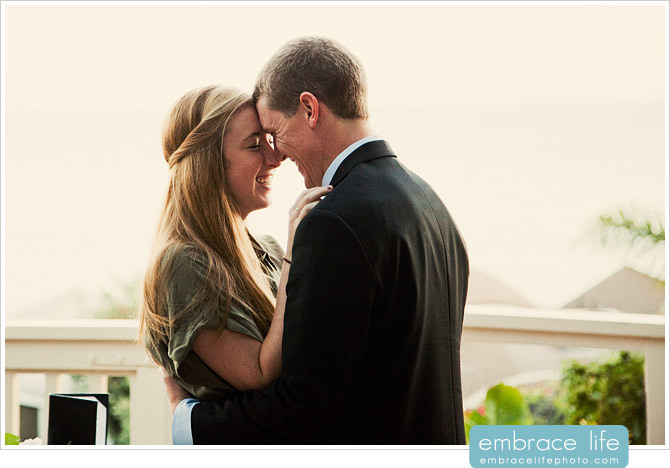 Last week I received a call from Mark asking if I could photograph his surprise proposal to Meredith. 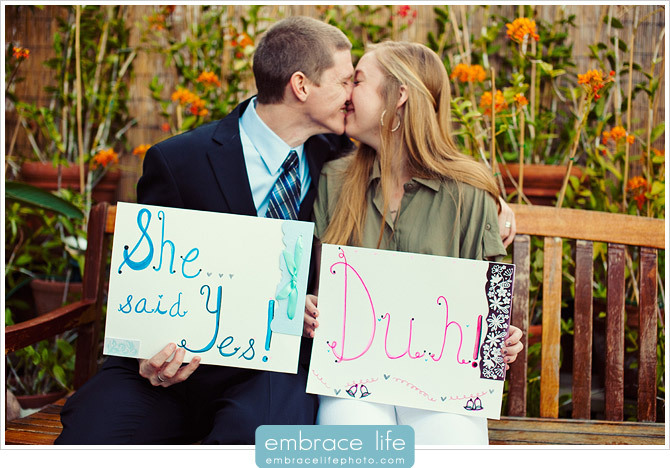 I love being a part of such an exciting moment in a couple’s relationship, so I was happy to say, “yes”. 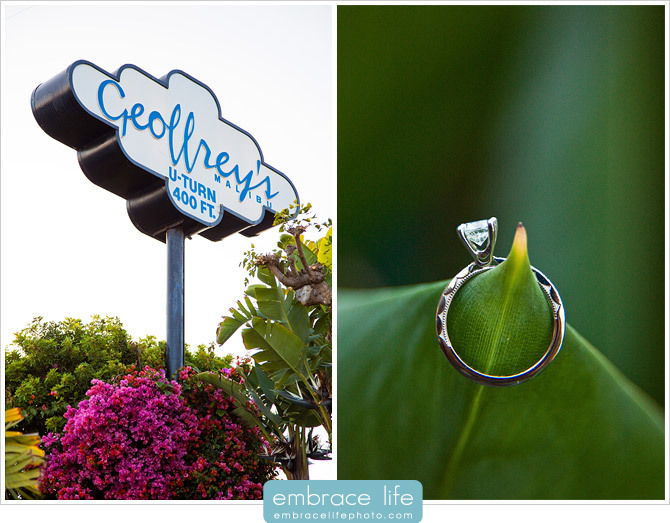 Mark chose the restaurant, Geoffrey’s, in Malibu, as the location for his proposal. This actually proved to make for some interesting challenges. When I arrived, I had my camera out and was taking some pictures of the restaurant sign. As I was doing that, a valet attendant approached me and asked me to be careful not to scare off “Leonardo”. My reaction was, “Huh?”. He explained that Leonardo Di Caprio was there having dinner and was skittish about my camera. So, I said, “Okay, no problem”. Obviously I had no intention of photographing “Leo”. Mark planned to have Meredith’s friend invite her to dinner at Geoffrey’s. He defined a specific table for the ladies and for me (directly across the patio from them), with a good view of their table. At some point, the friend would excuse herself to the restroom and Mark would walk up to propose. The hostesses and manager were aware of the plans and they brought me to the proper seat and showed me where the ladies would be. In anticipation of the ladies’ arrival, I slightly moved their table and chairs to provide me with a good profile view once they were seated and took some test exposures. Then, the manager came and moved the table and chairs to their original positions (which gave me a view of the backs of the chairs) and told me they had to stay exactly that way. Not good for me at all, but I couldn’t make a scene. I pled my case and he was kind enough to angle one of the chairs into a better position. At the same time, the manager asked me to put my camera away until I need it because it was making Leo uncomfortable. Apparently, he’s crazy paranoid about cameras. Kind of sad, and I empathize, but also kind of ridiculous. Anyway, I obliged as much as I could, but still received a glaring look from a friend of Leo’s. At this time, I sent Mark a text message and asked him to make sure Meredith’s friend would give Meredith the seat with the good angle. Shortly after that, I learned that the ladies were already in the restaurant, seated at a different table because of some confusion upon their arrival. Great! But, the hostesses were able to come up with some excuse about why they needed to have the ladies relocate to another table (ie. the correct table). Sweet! Keep in mind, I don’t know which of the ladies is Meredith, as we’ve never met, so I assume she’s the one seated in the ideal chair. Wrong. When Mark arrived he told me that Meredith is the one with her back to me. One challenge after another. You just have to laugh sometimes. Once Meredith’s friend excused herself, Mark moved in, tapped Meredith on the shoulder and asked her to stand up to give him a hug (now she was facing me – good move, Mark!) . That’s when Mark dropped to his knee and asked Meredith to be his wife to her happy surprise and the applause of the entire patio. Capturing the moments below was such and honor and these memories are absolutely priceless! Great job, Mark! Thank you for asking me to capture this for you and for doing such a good job detailing the plans. It was such an adventure for a few short minutes of action. 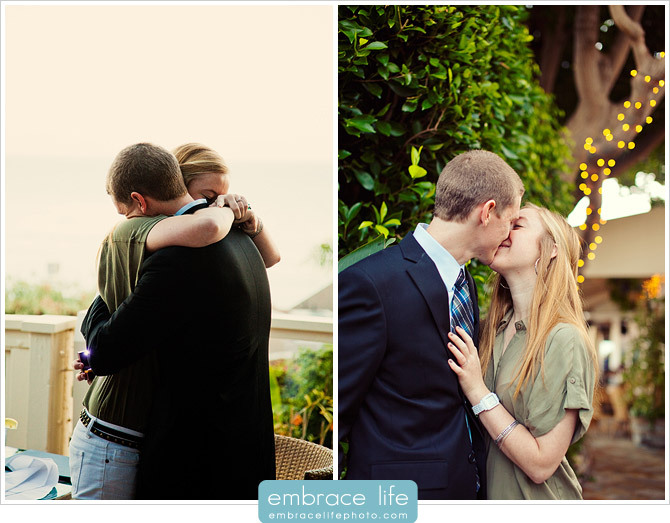 Congratulations Meredith and Mark! All the best to you both. 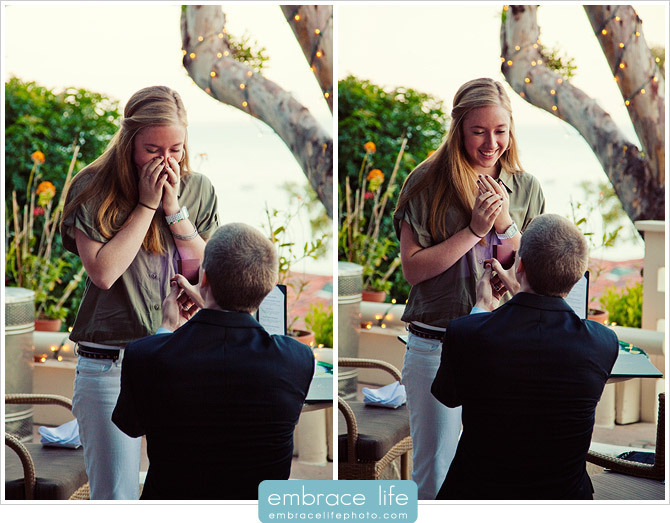 Amazing… I wish I was able to capture my proposal on film… Incredible memories captured!